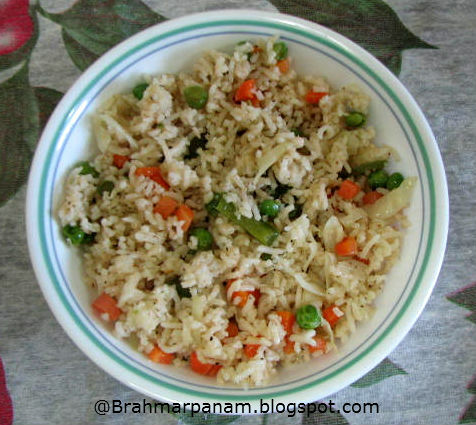 The Veg fried rice is an Indo-Chinese dish. This recipe tastes just like the ones you get in the restaurants. Try it to believe it! Heat a large pan and add olive oil. When oil is hot add the vegetables, cabbage, peas and capsicum and stir fry till the vegetables are just cooked but still crisp and not over cooked. Add the cooked rice, pepper powder, salt and soy sauce and mix everything well. Cook the fried rice for 2-3 minutes and serve hot. Olive oil is used here to get the restaurant style taste. However it could be replaced with any other oil too. Mix the rice with a fork so that it doesn't get broken or mushy. You may add or subtract the veggies according to your taste to make it more nutritious and tasty.